Are you tired of low or inconsistent sales results? One of the top reasons businesses fail, no matter the size or industry, is the inability to increase sales. Traditionally, salespeople rely far too heavily on their product/service and personality to win sales and fail to recognize the importance of a structured selling methodology. The fact is, your livelihood, and your organization’s growth and profitability, is dependent on your ability to consistently identify, qualify, and close business in your target markets. Work smarter, not harder, and learn how our repeatable selling process can help you grow your business. Find out how to avoid these critical errors that cost you sales. Predictable prospecting results is not a myth. For small sales teams, prospecting can be a roller-coaster—one month you're up, the next you're down. The ride isn't always fun. The Sandler Selling System levels out the sales playing field, so you can depend on predictable results. Using social selling tools like LinkedIn can be a huge game changer for sales teams on a budget. These tools can level the playing field, enabling salespeople to connect with prospects they pre-qualifiy by industry, company size or other key indicators. The caveat is that if you don't have a system to clearly define what you're looking for and a replicable system for what to do with it, this activity has the potential to become a black hole, consuming time that should be spent actually closing sales. Not all sales cycles are the same, especially when it comes to company size and number of decision makers. From small to med-sized, large and enterprise organizations, your job is to control the prospect to the close. Transform mediocre performers into selling superstars. The best-selling sales classic, with battle-tested advice on driving personal and organizational success by breaking the rules of conventional selling. 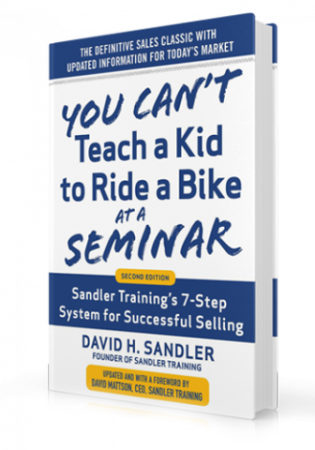 The second edition has been updated by Sandler CEO and President David Mattson who provides additional skills designed for today’s highly competitive, more complex, tech-savvy sales landscape.